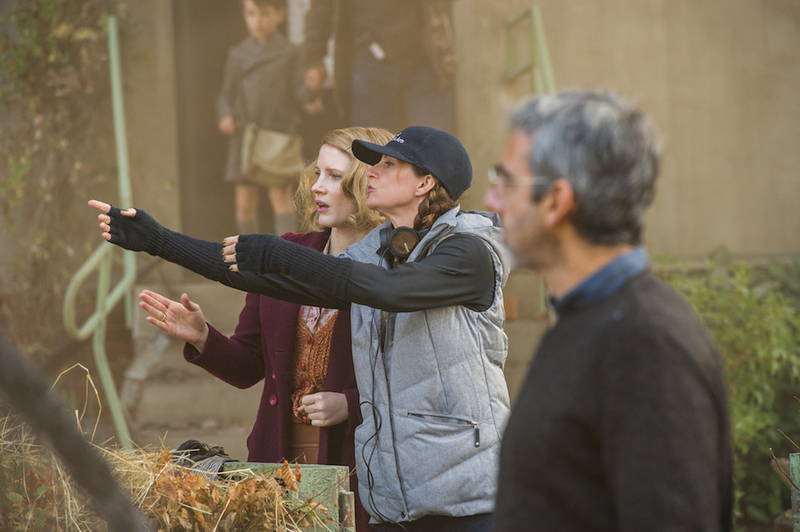 The Power of Animals: Niki Caro on "The Zookeeper's Wife"
Niki Caro’s new film, “The Zookeeper’s Wife,” stars Jessica Chastain as Antonina Zabinski. It is the true story of Warsaw zookeepers who saved the lives of Jews during the Holocaust, based on a book by Diane Ackerman. Caro, the director of “Whale Rider,” “North Country,” and “McFarland USA,” brings her passion for the natural world to all of her movies. In an interview with RogerEbert.com, the New Zealand native spoke about making the film, the “number eight wire” approach to filmmaking, and which scene she found the most moving. In that gorgeous opening scene, you make the world of the zoo and the animals so tactile and so enchanting. As a kid I was always barefoot, always outside and as an adult I always want to be outside. If I can work with real material, real stories, in this case real animals, I will. I couldn't conceive of making an authentic version of Antonina's story by using fake animals. All of them are real except for the babies. All of the babies are puppets and anytime you see an animal that is hurt or killed it is a puppet or has been augmented with visual effects. I want to ask you about the scene right at the beginning where Antonina is riding her bicycle through the zoo, is exploring her very garden of Eden-like environment and greeting all of the animals so lovingly. We had to shoot that in pre-production because I wasn't convinced that the weather would hold until we started the main unit. So that was the very first thing we shot and we shot it before we were really up to speed. And yet it was joyous and kind of effortless. You know when you work with animals you have to do so very carefully, species by species. It's quite painstaking to put a sequence like that together particularly when the philosophy was very much to create an environment where animals felt very relaxed and we sort of took their lead as opposed to requiring them to do stuff for the camera. The magic of the sequence is Jessica's magic with animals—she is a whisperer. So, fortuitously for this movie, I couldn't have made this movie without her and neither would I want to. The interactions you see with her and the animals are really her. Nobody doubled for her and all the animal responses to her are genuine. Wow! Another scene I wanted to ask you about is one of the most intense and painful scenes in the film, which is when Antonina is reaching out to that poor girl who has been hurt so badly she can't even speak. Antonina's instinct to care and protect and nurture animals was just transposed to the human species. In that scene you see a child. The damage to her has been so significant that it rendered her an animal. Antonina uses all of her instincts to begin to restore this child back to humanity and she uses an animal to do so. That was a big part of the story of the movie—the healing power of animals—and we can see that the touch of them is comforting. Their innocence is so pure. The transfer of that little bunny from the zookeeper's wife to one of her first human guests is the most moving part of the movie, I think. Tell me a little bit about what the challenges were of re-creating that era. This particular period I felt a tremendous responsibility to and so I had really, really gifted collaborators. Our production designer, Suzie Davies, built the zoo for us. We needed to re-create Warsaw before the war in the 30’s, which was a very sophisticated, very cosmopolitan city, very beautiful. In fact it was known as the Paris of the North. We couldn’t shoot in Warsaw because it had been so destroyed by the war and then rebuilt, so it is very modern now. So we needed to find a place that could stand in for Warsaw and we found that place in Prague. It was beautiful. And Suzie found right in the center of the city a really neglected exhibition park and took me there and she said, “I think we can make our zoo here.” We knew we would have to create our own zoo because you need so much flexibility in a movie and as well the modern zoos are modern even if they don’t appear to be. We wanted to create a Belle Époque Zoo that was representative of Warsaw of that time, something very, very beautiful. And we had to create five stages of disintegration, as we had to express six years of the war so the only time that it was ever beautiful was for those two days in pre-production. And then when I came back it had already gone through the first stage of bombing. And as for the period look for the costumes, in Jessica's research with Antonina's daughter, Teresa, she learned a very interesting thing and that was that Teresa had never in her life saw her mother wearing pants. And that was really challenging for us. It was challenging for Jessica and me and our costume designer, Bina Daigeler, because we had presumed women wore pants in the '30s and [Antonina] was a zookeeper. How could you ever do it without wearing pants? But we were really committed to the authenticity of this character. So she never wears pants in the film. She wears boots with her skirt when she’s out and about in the zoo but we were very respectful of her femininity. Antonina was very, very soft, very feminine, but also very strong and that’s reflected in her wardrobe and the costuming throughout the movie. What’s the best advice you ever got about directing? You know, what is so curious about being a director is that you never get on anybody else’s set and see how they do things. When I was starting out I was way too scared to ask real directors how to do it or ask for advice, I'm really kind of New Zealand like that. We have a term for it: “the number eight wire mentality.” That is the wire you use in fences that keeps you in and it means that New Zealanders can make anything out of whatever is on hand. I carry a lot of that with me and I carried a lot of that sensibility into filmmaking which is I am very pragmatic, but I am very connected to the story I’m telling and to my collaborators in the telling of the story. I think I sort of made up a way of filmmaking that really works for me without too much advice from other directors as much as I would have, I really, really wanted it and needed it at the time. But I sort of stumbled along and instinctively found my voice and my process and once I found that, I think I found it pretty much on “Whale Rider” and I’ve been working that way ever since.